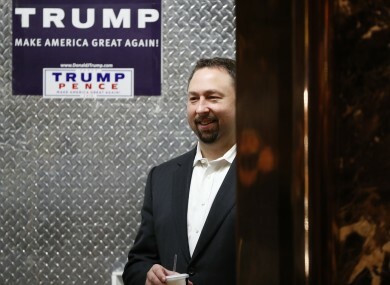 Jason Miller was named director of communications in the new administration, but doesn’t want the role. PRESIDENT-ELECT DONALD Trump’s pick for a key spokesman position has turned the job down, just days after his appointment was announced. Jason Miller was named director of communications in the new Trump administration on Thursday, but in a weekend statement he said he wanted to spend more time with his family. “After spending this past week with my family, the most amount of time I have been able to spend with them since March 2015, it is clear they need to be my top priority right now,” Miller said in a statement, noting that he and his wife were expecting their second daughter. This is not the right time to start a new job as demanding as White House communications director. Miller had served as a senior Trump spokesman, and the communications director’s role is to shape the administration’s media strategy. He said in his statement that Trump spokesman Sean Spicer will assume the communications director role. Miller had previously worked for Senator Ted Cruz, one of Trump’s rivals in the Republican presidential campaign. US media outlets have also been reporting how the President and President-elect spent Christmas. President Obama and his daughters spent part of the Christmas weekend playing an “escape room” game, while Donald Trump ushered in the celebrations with a visit to church on Saturday. According to pool reports, Obama, Sasha and Malia and some friends spent part of Christmas Eve evening playing ‘Breakout Waikiki’ – a live-action game where players are locked in a room with one hour to figure out a series of clues and riddles to escape. The Obamas are spending the holidays in Hawaii. President-elect Trump and his wife, Melania, who are spending their Christmas at the family’s Mar-A-Lago resort in Florida, attended services late on Saturday at the Episcopal Church of Bethesda-by-the-Sea in Palm Beach – the same church where they were married in 2005. Meanwhile, both Obama and Trump sent out holiday greetings via Twitter. © – AFP, 2016 with reporting by Daragh Brophy. Email “Trump's pick for key spokesman role turns down job, citing family reasons”. Feedback on “Trump's pick for key spokesman role turns down job, citing family reasons”.